A collection of scripts that change your read nodes settings. selectRead: Select all your read nodes. setLocalization: Set localization policy on read nodes only or more. 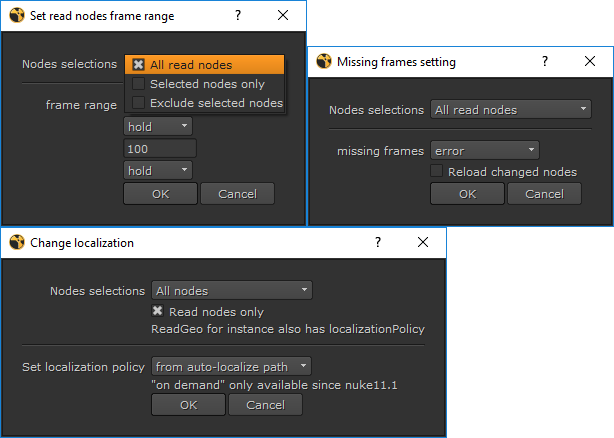 setFrameRange: Set start, last, before and after settings on read nodes. setError: Set what happens if there's missing frames (on_error) on read nodes. selectRead: Click, and it'll select all your read nodes! setLocalization: A simple pop up for you to set localization policy, for read nodes only or everything! Note: 'Convert file path to absolute', 'Select Nodes with File Knob' and 'Set Project Directory' comes from another script called SetProjDir. As shown below 'on demand' is new from nuke11.1. If you select 'on demand' in previous versions it will simply becomes 'off'. Simple as that! I plan to add another pop up that changes 'on_error' knob on read nodes in the future because I'm that lazy to deal with one read node at a time. I have not tested this in any nuke version that's older than nuke 10 but I don't see why it wouldn't work. Same goes with Mac and Linux. Please let me know if you tried them out in any of them and they works!